If you've ever loaned money and not been repaid, you understand the need for a Loan Agreement. A legally binding Loan Agreement not only maps out the terms of the loan, but it also protects you if the borrower defaults on the loan. You are loaning money to someone and want a signed agreement. You are borrowing money and want to show that you agree to repay. You wish to prepare an amortization table if the loan includes interest. You want to configure the monthly payment amount on a loan agreement. You need a Loan Agreement that includes collateral. Our Personal Loan Agreements cover all loan basics such as loan amount, repayment options and default consequences. The form can also create an amortization schedule and calculate the paid in full date. What is included in a Loan Agreement? Our Loan Agreement Form can be used to create a legally binding agreement suitable for any state. It is simple to use, and it only takes a few minutes to make a Loan Contract. Even though it is easy to make a document, you'll need to gather a bit of information to make the process go faster. Address of the borrower and the lender. You'll need to decide when payments are due or if you want the loan to be repaid in one lump sum. You can also configure the Loan Repayment Agreement to include monthly payments with a large balloon payment if you want. Not everyone charges interest on a personal loan, but you can if you want to get paid back more than you loaned. You'll also need to decide how you want the interest paid and if there will be any benefits to the borrower if they pay the loan balance early. You'll need to decide when payments are considered late and the amount of the late fee if any. If the borrower violates the terms of the agreement, you can define what happens if they default such as transferring the ownership of collateral to you. If someone is looking to borrow money from an individual they likely do not qualify for a traditional bank loan, so collateral is used to secure the loan. Typical collateral items include vehicles or real estate. A cosigner is someone with good credit who is willing to take over payment responsibility for the loan if the borrower defaults. A cosigner is often used to secure loans to young people who have not yet established their credit history. You can include a provision in the agreement that allows the lender to sell the loan. This option is not extremely common in personal loans, but it is a possibility you can include. Should I charge interest on a personal loan? It is up to you. Often parents don't charge interest on small loans to their children but may for large purchases such as a home (at least to offset what the money would have earned in an interest-earning account). If the loan is a business loan, often the interest payments can be claimed as a deduction with the IRS, so you may as well charge interest. Interest rates for personal loans are usually between ten and thirty percent. Business loans are generally less. If you want to use the loan as a money-making opportunity, you should charge interest. If you are loaning money as a personal favor, you may decide not to charge interest. The Loan Agreement Form can help you configure what the total payment amount will be based on interest, how the interest is charged and how many payments will be made. If you decide to charge interest, the Loan Agreement supports two ways of charging interest. You can select that regular payments go towards the interest or that regular payments go towards interest and part of the principle. The first method is the costliest for the borrower since the interest is paid before the original loan amount, which makes it most advantageous for the lender since they get paid back more if the borrower makes all required payments. The amortization schedule will show how payments are allocated. What is the best payment schedule? The best payment schedule is one the borrower can manage. Often lenders require monthly payments. But perhaps the borrower may find it easier to make two smaller payments per month. That option is viable, as well. Or, if the borrow is expecting a windfall (such as a tax refund), you can make the document say that one lump sum payment is required by a certain date. You can decide which payment schedule will work best for your loan. Should I loan money to someone with bad credit? If someone is asking you for a loan they likely don't think they would qualify for a bank loan or the interest rate would be high. The ability to repay the loan is sometimes more important than a credit score when considering a personal loan. If the borrower cannot show how they will be able to make payments, it is in everyone's best interest to not complete the loan. If they don't know what their credit rating is or what debt they owe, they can easily obtain their credit report using an online service. 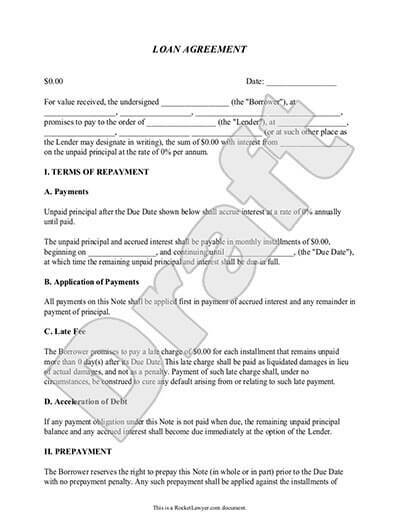 Promissory Note is similar to a Loan Agreement. However, it is a simpler form and doesn't usually include as many provisions as a Loan Agreement. An IOU agreement is a step above a handshake agreement. It is suitable for small personal loans. If you've already loaned money and are having a difficult time collecting payments, see How to Collect Personal Debt from a Friend, Family Member or a Business. 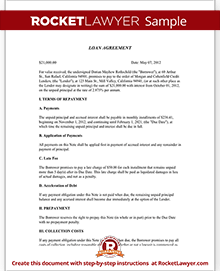 Our step-by-step interview process makes creating a printable Loan Agreement easy.